Bought a couple of bits over the years and I can’t say the service is bad because that would be unfair and very harsh - I can however say I’ve recently used another electrical supplier and found the service to be better. 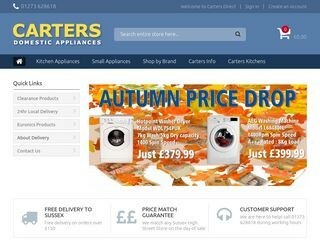 I've tried getting appliances from more well known high street shops but always ran in to a problem whether it be delivery or ordering and then it being out of stock, so decided to visit carters in Southwick when I needed a new washing machine. Was totally hassle free, staff very informative and helpful. Delivered on time and very reasonable price.